One of the worst things to happen while transporting a paddle board is for the wheels of the cart to break! But have no fear, with these high quality carts you’ll hopefully never have to experience this. 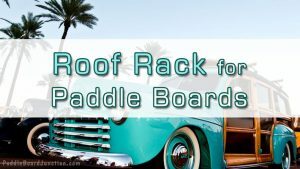 Looking for the Best Paddle Board Cart? 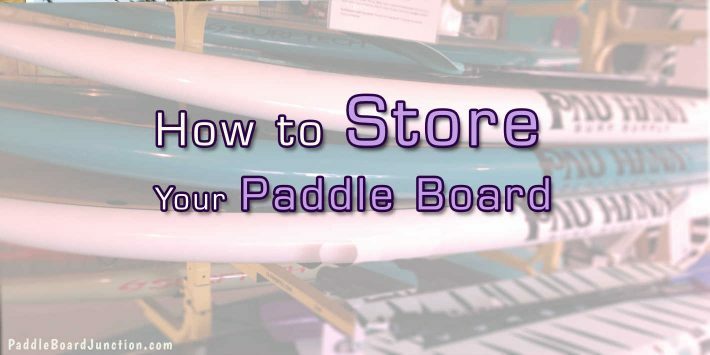 Are stable and can support one or more standard-sized stand up paddle boards. Have foam pads/bumpers that protect your board from scratches and keep it from slipping. Have high quality wheels that can withstand a variety of terrains including sand, gravel, mulch, grass, and much more. The Apex Paddle Board Dolly is made from aluminum construction and has wide, pneumatic tires that can handle sand, grass, mulch and more. 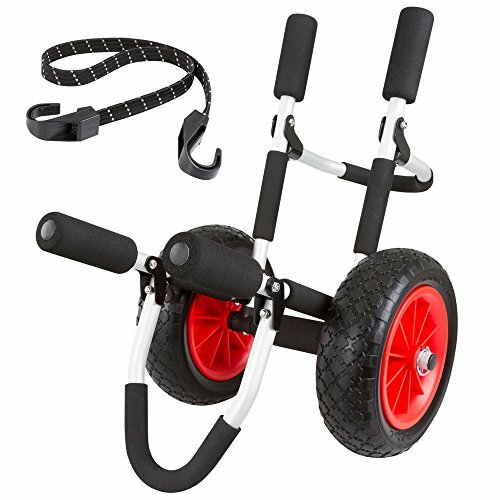 This dolly has a heavy duty bungee cord strap that ties your board to the cart, and the aluminum frame of the cart has foam bumper pads to protect your board from scratches. This cart can also fold up for storage convenience. Most of the reviews note that the Apex Paddle Board Dolly is easy to assemble and keeps the board secure and in place. The average review rating of this board is 4.2 out of 5 stars. Just note that this paddle board cart will only fit one board that is 5 inches thick or less. This paddle board cart is built to handle two boards at once, which is great for those of you that have partners that paddle board with you. It has a heavy duty aluminum frame that is coated with stainless steel, so there’s no room for rusting. The frame is stable and strong enough to support two paddle boards. This double SUP cart also has thick Neoprene foam pads covering the metal arms that the boards rest on. This prevents damage to your boards while simultaneously preventing the boards from slipping out of the cart. 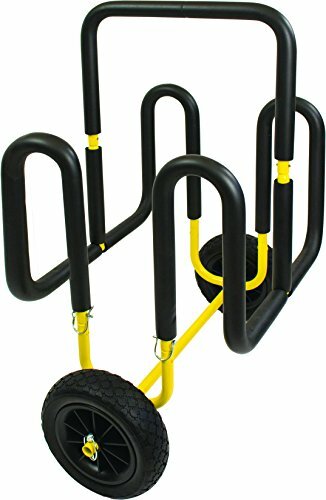 The cart also has airless wheels, so it’s impossible to get a flat tire and it’ll also save you the hassle of inflating! The wheels can also handle any kind of ground, whether it’s sand, gravel, dirt, mulch, or anything else. The cart itself also has a weight capacity of 150 pounds. The customer reviews note that this cart is very easy to assemble and gets everyone’s boards to the beach as easy as it can be! The average review rating for this paddle board cart is 5 out of 5 stars. 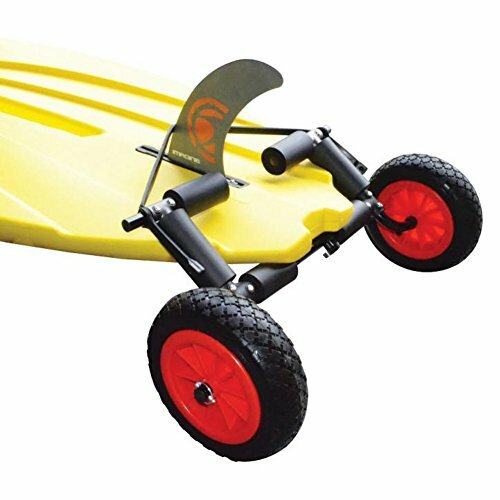 This SUP Carrier is another two-wheeler single paddle board cart, but it’s a high quality one at that! It has a strong marine grade anodized aluminum frame with foam bumpers to protect your board. 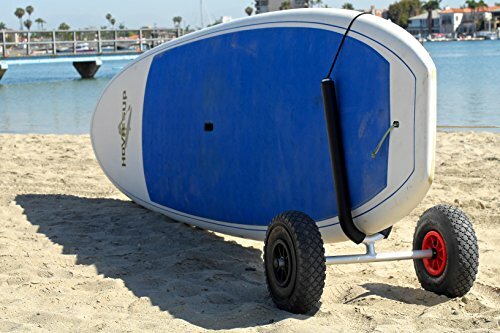 With a simple heavy-duty bungee cord, your board attaches to this SUP Carrier Cart easily and allows you to wheel your board to the water safe and secure. This cart also is available in two widths to accommodate larger boards, which is very convenient. The two widths that this cart comes in are: 4.5 inches or 5.5 inches. 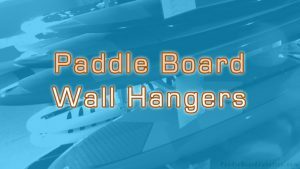 The width of 4.5 inches will accommodate regular sized paddle boards, while the width of 5.5 inches accommodates larger paddle boards. Simply adding an SUP suction-cup transport handle will help you wheel your board to the beach with ease! The customer review for this cart mentioned that their board did not have a tight fit in the cart. If your board is loose in the frame of the cart, you can add foam pipe insulation secured with waterproof tape for a snugger fit. The average review rating for this cart is 5 out of 5 stars. The Malone Solocart SUP cart has a strong frame made of anodized aluminum, with a stainless steel hardware. With airless tires, there’s no need for inflating and it’s impossible to have a flat. The Malone SUP cart carries your paddle board lying flat, not on its side. Therefore, the width of the frame is larger than a normal SUP cart. The width of the Malone cart also adjusts from 14 inches to 21 inches. 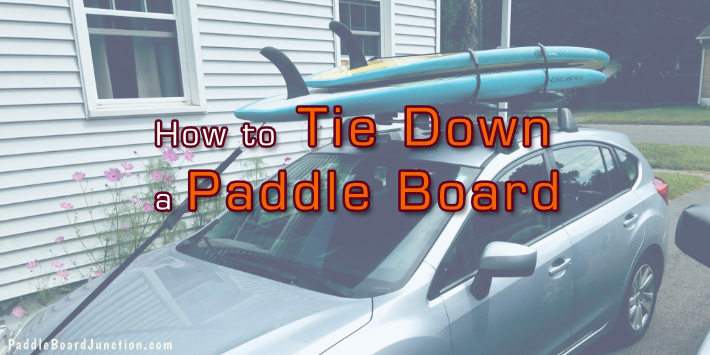 The customer review notes that the Malone SUP cart makes it easier to get their board to the water, and that they can save their strength for paddling on the water. The average review rating for this cart is 5 out of 5 stars. If you need to carry two boards to the water instead of just one, the 2 SUP Carrier Paddle Board Cart is the cart for you. It has a heavy-duty frame, a padded exterior, and airless wheels. 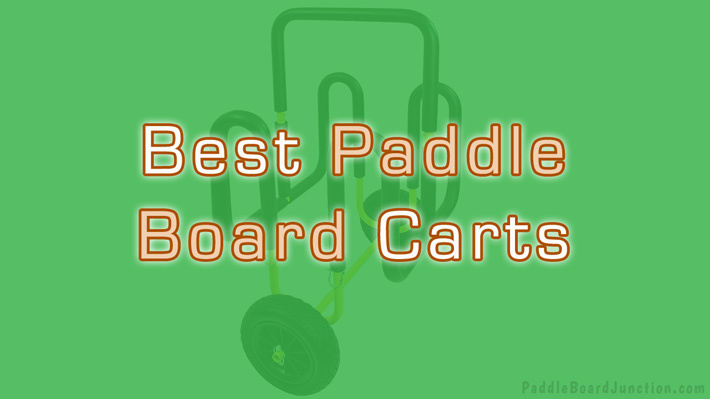 If you only have one board that you need to carry to the water, you can choose between the Apex Paddle Board Dolly, the SUP Carrier Wheeled Paddle Board Cart, or the Malone Solocart SUP cart. 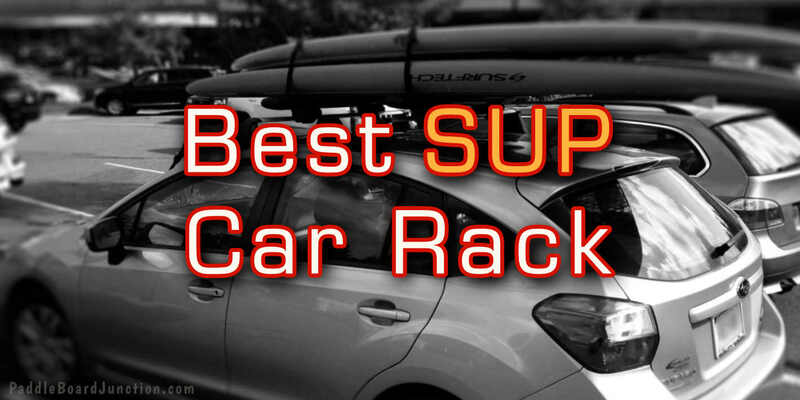 Just note that the SUP Carrier is better for thicker paddle boards, and the Malone cart carries the paddle board lying flat.